Thank you to ALL for coming to the Magnis Croquet Tournament 2018 on Saturday 11th August. Perhaps the rain made it all the more a typically British summer’s afternoon of playing a peculiarly British game. 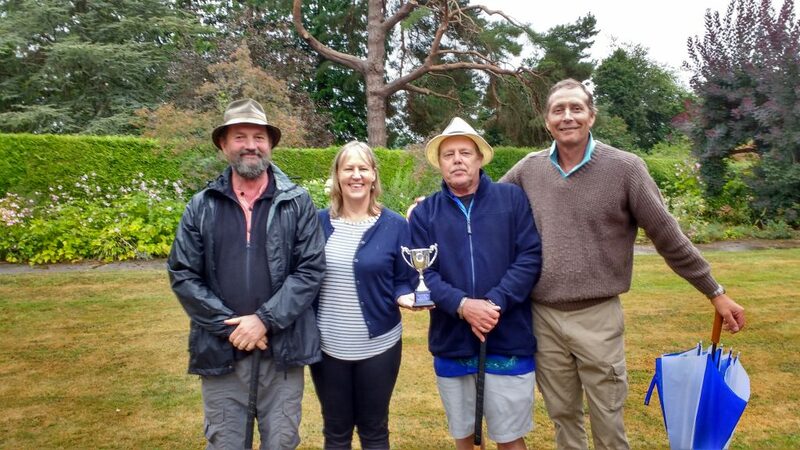 Joining in the fun were teams from local parishes – Bishopstone, Bridge Sollars, Brinsop, Kenchester and Mansel Lacey – and after 3 rounds playing on 2 courts in the wonderful grounds of Bishopstone House, the winners were the team from Bishopstone. David Macklin has now counted the proceeds – we made a little less than at Kenchester last year but, despite the rain, we still made a very decent total of £385. We plan to use the same formula as was used last year, i.e. two-thirds to the host parish PCC and one-third divided between the other parishes’ PCCs. A very big thanks for our hosts, Matt and Sybella Kirkbride.